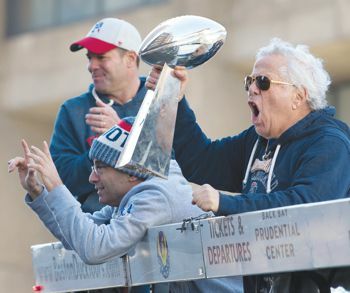 With trophy in hand, Patriots Owner Bob Kraft, along with his sons Josh Kraft and Dan Kraft, are exuberant in the Super Bowl LIII victory during Tuesday’s rolling rally in the Back Bay. Meanwhile, Defensive Lineman Trey Flowers gives a parting kiss to the Super Bowl LIII trophy as players descend on City Hall Plaza in Boston. There is no shortage of Super Bowl parties going on in Chelsea this weekend, but if one wants their party to score high, they better know how to prepare a proper chicken wing. Chef/Pitmaster Andy Husbands of The Smoke Shop (located in Assembly Row in Somerville) said that if hosts think getting a good wing on the table for the Super Bowl is as easy as popping them in a hot oven, they would be flapping wrong. In fact, he said, the key to a good Super Bowl spread is preparation and thinking ahead. Husbands said the centerpiece of a Super Bowl spread always has to be the wings, so getting them right is important. Husbands suggests doing what is called a confit. “You want the best wings, and even though it’s a bit complicated, I would look up how to confit wings,” he said. When he pulls it off, Husbands said he starts by seasoning the raw wings the day before with salt and other flavorings. Many make the mistake, he said, of putting the sauce – whether buffalo or teriyaki sauce – on before cooking the wings. One should not do that, he said. Once seasoned, Husbands coats the wings in oil and chicken or goose fat. Then they go into a 205-degree oven until cooked. Then, take them out, let them cool and remove the fat. The next day, before the big game, take them out of the refrigerator and use the fat from the previous day on a sheet pan. Put the wings in the fat and cook them in an oven at 350 degrees until crispy. There are, of course, other ways to wing it for the big game. Home frying, however, is not something Husbands recommends. Most people don’t have the right equipment and it uses a ton of fat for just one dish. Cooking them in the oven after seasoning is another option, but it has to be on low heat. A common mistake, he said, is putting the wings in the oven raw at a high temperature to get them crispy. However, that leads to a dry and bony wing – perhaps even raw. Yet another way goes to the die-hards, who will take the opportunity to do some arctic grilling. Husbands said the cold weather won’t stop him from grilling wings and smoking ribs for his Super Bowl party. Beyond the meat of the matter, though, Husbands has some good ideas for buffet style options. One of those ideas is a chili bar. He usually cooks a pot of chili and leaves it on low in the Crock Pot, setting up a chili fixin’s salad bar next to it. At halftime, he rolls out a hot dog bar too. Either grilled or boiled, he selects quality hot dogs and two different kinds of buns. From there, the sky is the limit on the kinds of toppings one can offer to guests. Husbands suggests kimchee, several different types of mustard, cheese sauce, unique pickle relishes and even his own favorite, sriracha ketchup. For the beer lovers, Husbands suggests not going all lawnmower and not going all high-brow either. In his ice chest, he said he offers everything from Miller High Life to Trillium Brewery. Super Bowl LIII official coverage starts at 6 p.m. on CBS. Andy Husbands is an award-winning chef and pitmaster at The Smoke House, which has locations in Assembly Row, the Seaport and Cambridge. Just this year he closed down his long-time South End restaurants Tremont 647 and Sister Sorel – which were neighborhood staples for decades. As everyone focuses on New Hampshire right now for the presidential campaign, the Massachusetts Primary is not that far away with a date to vote on March 1 – known a Super Tuesday. There are four candidates on the Democratic Presidential Primary ballot in Massachusetts, 13 Republican candidates and five Green Rainbow candidates for voters to pick from. To get on the ballot, State Committee chairs must submit lists of candidates to the Secretary of State. If those lists do not contain certain names, the Secretary has the right to add the name of any well-known national candidates. The third way to get on the ballot is to collect 2,500 signatures. The deadline for that process came on Jan. 4, and one candidate qualified for the Democratic ballot in that fashion – Roque ‘Rocky’ De la Fuente of California. Massachusetts’ Primary Election has evolved over the years with Super Tuesday to become more of an important event. Though it has been on March 1 for some years, the many states combining to hold Primary Elections on March 1 have bulked up the importance of those holding elections on that day. The deadline to register to vote in the presidential primary on March 1 is Feb. 20. Sidebar not configured yet. You can place widgets by navigating to WordPress Appearance > Widgets. © 2013 CompanyName. All rights reserved.